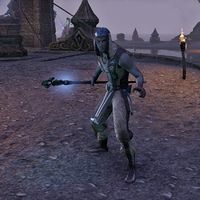 Acamas is a Maormer Storm Mage and member of the Sea Vipers who can be found at the ritual site north of Cat's Eye Quay. He is one of the three mages attempting to overload the Storm-Slave with the goal of destroying Mistral and beyond. This page was last modified on 9 March 2019, at 08:02.